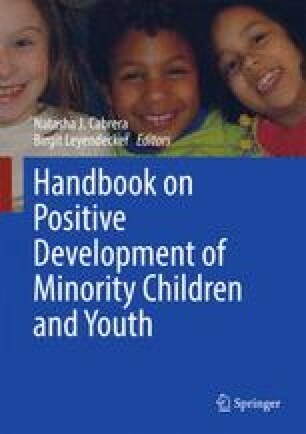 This chapter provides an international perspective on parenting and children’s adjustment, which can inform understanding of the development of minority children. It begins with an historical overview of this area of inquiry, which has been conducted primarily with North American and Western European samples, and presents two of the main theories that have guided research attempting to understand children’s development in cultural contexts. The chapter then describes current key research questions as well as measurement and methodological issues in adopting an international perspective. The bulk of the chapter reviews empirical research on links between parenting and children’s adjustment in a variety of domains (socioemotional adjustment, behavioral adjustment, academic achievement, moral development, social relationships) around the world. The chapter then highlights universal versus culture-specific mechanisms through which parenting has been found to relate to children’s adjustment. Finally, the chapter suggests policy implications and directions for future research. Throughout, the review of theories and empirical research is not comprehensive but rather illustrative, attempting to provide an international framework in which to conceptualize parenting and children’s adjustment.